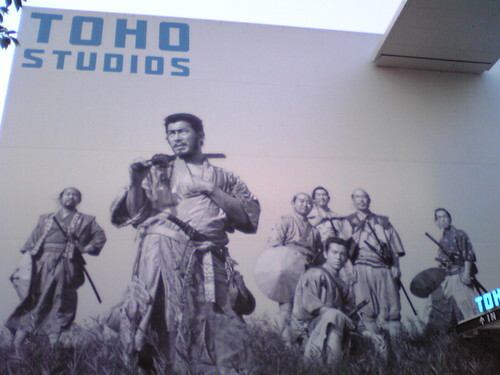 As mentioned before, I've been doing the rest of the post-production of my Japanese film, KINGYO, at the famed Toho Studios. On the 29th, I went there (that was the time when I snapped the photo of Colonel Sanders dressed as Eva-01) and had to do the last bit of editing before Torigoe the sound engineer can finish his bit of sound mixing. 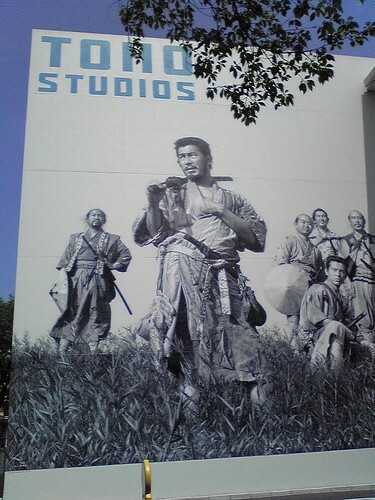 When I posted the photo of this huge Seven Samurai painting on one of the buildings in the studio, Dabido on Facebook, pointed out that there were only six samurai in it. I didn't notice that before he mentioned it. The one missing guy was the samurai leader Kambei Shimada played by Takashi Shimura the sixth samurai Kyuzo (Maiko the producer's favourite, she pointed out) played by Seiji Miyaguchi. I decided to do him justice by taking another photo of the massive painting. By the time I was about to finish the editing it was nearly midnight. Maiko the Producer, Lia the Assistant Director and Torigoe decided to head for the train station. I chose to spend the night there because I knew there would still be some adjustments and tweaking I wanted to do with the film. Spending the night alone in an editing suite of Toho Studios is something I want to tell my grandkids about in the future. So there I was, doing some editing, surfing the net, nothing out of ordinary. 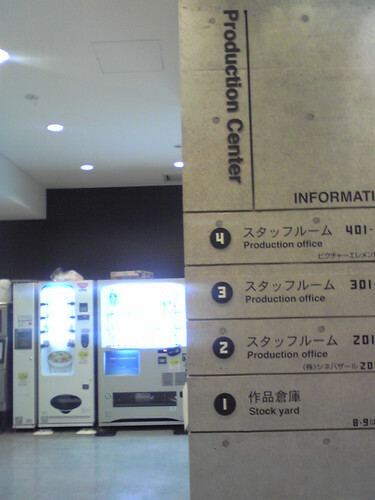 When walking to the vending machine closest to my room, I tried to take a photo of some other buildings in the studio. 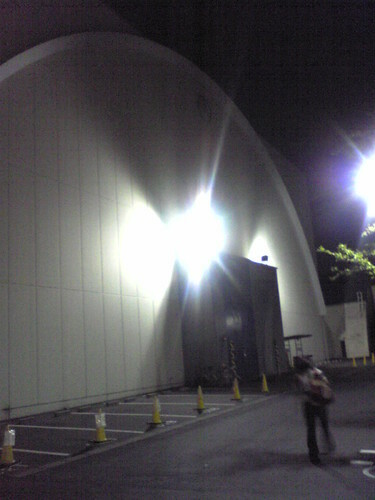 As you can see, even though it's late at night, there were still some people roaming around Toho, probably studio employees burning the midnight oil on some production. It would've been interesting if I have stumbled upon a film shoot. Now here's a photo of the vending machines I often go to. There was a sofa in the editing suite that's very comfortable, so it wasn't too difficult for me to fall asleep when it was my usual bedtime (4am). For safety, I locked the door before I slept. In the morning I was awakened by the sound of door opening, and as I got up I saw a security guard seemingly looking very apologetic that he had interrupted my sleep. He was holding a clipboard and asking me something, I was in a daze, and sleepily, I mentioned "Itagaki...", last name of Maiko the producer since she was the one who signed her name when we entered the day before. The guard looked at his clipboard, and then nodded politely to me and left. I went back to sleep. When I woke up again it was half past ten in the morning. I switched on to Final Cut Pro to resume editing, while also checking the latest results for the NBA playoffs on Yahoo Sports. I felt hungry when the clock struck twelve and decided that it was time to have brunch. As I reached for the door, I was mildly surprised that it was locked. I wondered whether the security guard I spoke to that morning had locked the door for me. Or whether the conversation with him was just a dream. Or whether it was... something else that I don't really want to think about. 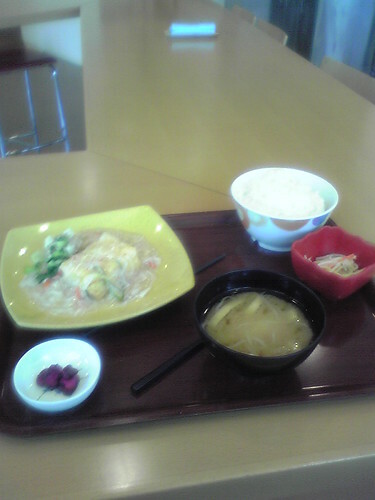 I went to the cafeteria. 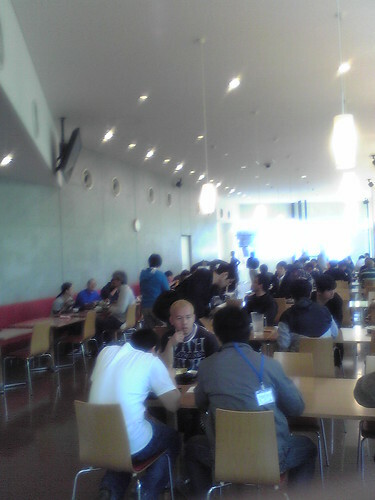 It reminded me of the cafeteria in Waseda University. I was hoping to see maybe some actors and cute actresses having their meals there as well. But no such luck. The set of the day for that day was tofu and rice for the price of 500 yen. It was quite tasty, but slightly pricey for what it was. Few days have passed. It is now the Golden Week, when several Japanese public holidays occur throughout the week (first week of May). I myself will also be taking a couple of days off from the film (until the 7th) because Maiko the Producer told me that Toho Studios will be closed as well. 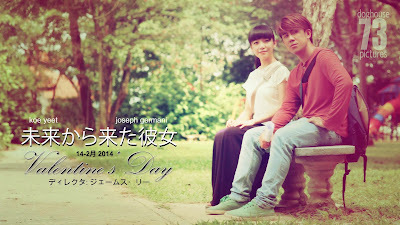 I'm predicting that the (almost) final cut of the film will be done by the 9th or 10th of May.